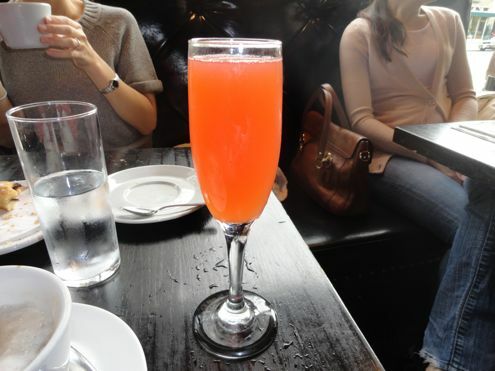 Last weekend, Rachel and I went up to Baltimore for the day and headed up to Woodberry Kitchen for Saturday brunch. 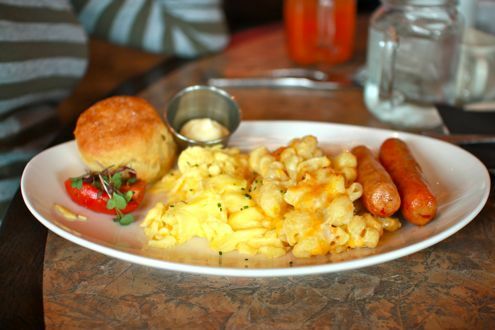 We have always wanted to dine at one of Baltimore’s finest establishments, so brunch was an affordable way to introduce ourselves to Chef Spike Gjerde’s cuisine. Of course, getting to this restaurant isn’t the easiest of tasks as it’s tucked away in a 19th century foundry in the Hampden neighborhood. Good thing we had a GPS, otherwise we would have easily gotten lost trying to find the place. Complimentary valet parking is provided, and after quickly surveying the narrow road for street parking, it’s probably your best bet. 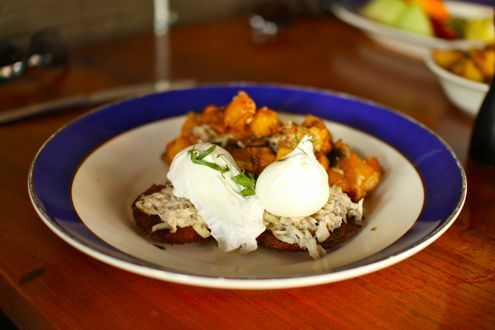 Once stepping inside, the rustic interior and friendly staff reminds you why Baltimore is nicknamed Charm City: Woodberry Kitchen simply oozes it. Just a few steps from our table was an enormous grandfather clock sitting adjacent to a shelf housing all sort of pickled items in glass jars. We started the meal off with French press coffee for the entire table while Rachel got a glass of freshly-squeezed orange juice. On top of that, we ordered the Tilghman Island Crab Pot to split amongst the four of us. 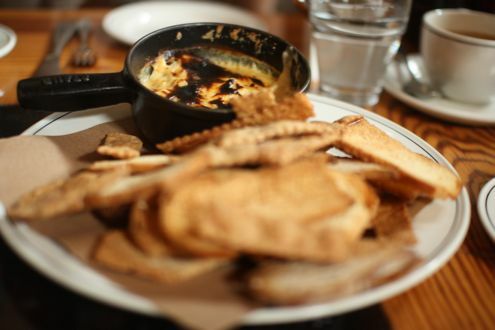 The restaurant’s rendition of crab dib, it was prepared with lump crabmeat, cream cheese, and sherry poured on top and accompanied with a variety of toast points. 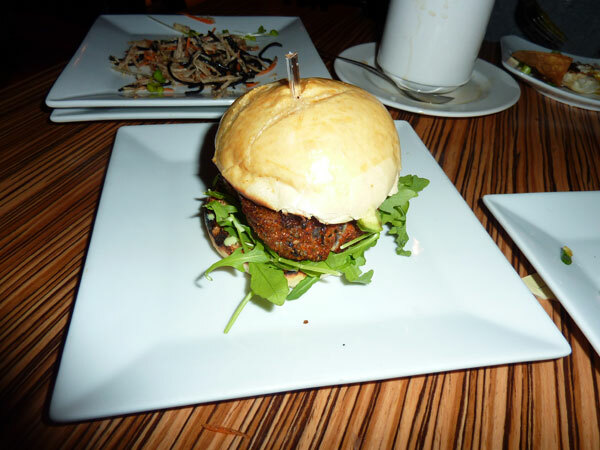 As anticipated, it was a very savory appetizer. Rich and creamy, the pot was scraped clean by our party (okay, maybe just me). 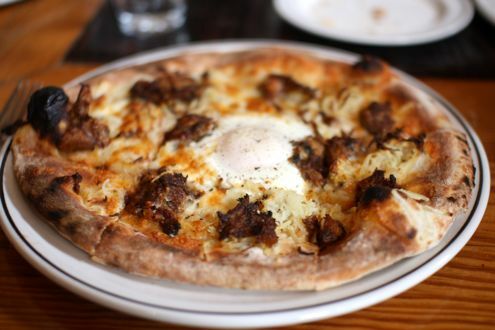 For our entrees, I ordered the Morning Flatbread. This morning’s rendition featured potato, Hawks Hill cheddar, farm egg, and some of the most delicious barbecue pork shoulder I have ever come across. I’ve been to countless BBQ places across the country, but the tender pork found on this flatbread was without a doubt some of the best. Spreading the egg yolk across the flatbread gave the dish a nice consistency, and it was especially hard to put the fork down if one of the slices featured a piece of succulent pork atop it. 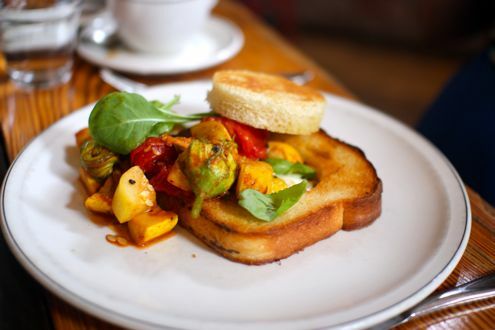 Rachel ordered the Egg in a Hole, which was essentially Pullman toast with a circle cut out and an egg cooked inside, served with heirloom tomatoes, squash and their blossoms, and rocket. The dish is served best with the egg runny, and even though Rachel couldn’t have it that way since we still have a bun in the oven, she loved the rich buttery toast and the accompanying vegetables which were fresh and tasted like they were just picked from the garden. 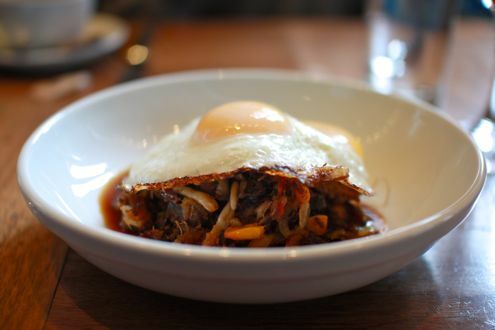 Brunch at Woodberry Kitchen was a fantastic experience – between the excellent food and service, we would love to return for dinner down the road. And if that pork shoulder is listed on the menu on our next visit, it’s pretty much guaranteed that I will be ordering it. In early March, Brett and I had a wonderful weekend in New York City to celebrate our second wedding anniversary. We had some amazing food (more on that to come), but I thought I’d start our trip recap with one of the more casual and fun places that we went to. We were looking for a place to go for brunch on Saturday that was near our hotel, affordable, and had a good number of options to choose from. 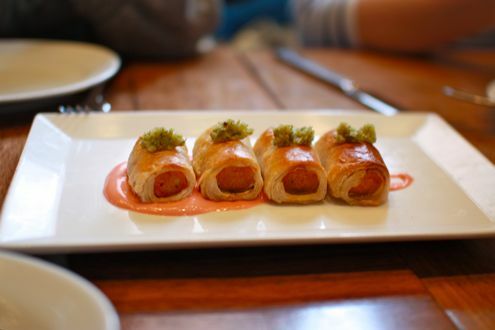 Our friends suggested 9 Restaurant NYC in Hell’s Kitchen, so off we went. Upon checking in on FourSquare, Brett noticed a deal for a free glass of sangria (score!). Not a bad way to start our morning. Looking over the menu, several items sounded appealing, but the one I kept coming back to and couldn’t resist was dubbed The King French Toast. It was essentially a large piece of French toast topped with peanut butter, banana, maple syrup, and bacon. 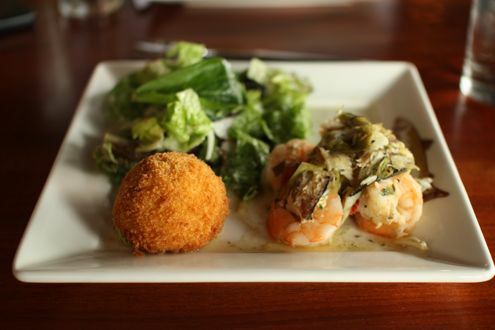 Just what Elvis would have ordered. I couldn’t resist trying it, partly out of curiosity and but also because I love the combination of peanut butter and bananas. 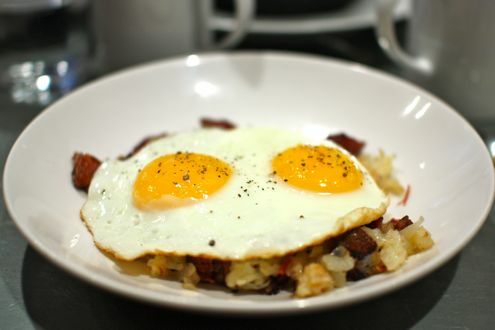 Plus, bacon and maple syrup could only make it better! Well, let’s just say I made the right choice since Brett and our friends were eying my meal and looking rather envious that they hadn’t ordered it as well. When it arrived, the French toast looked more like a piece of cake than its traditional appearance as it was one very tall piece of bread. Also, the way the bacon was assembled on top made it look like a crown fit for a king. Once I broke into it and ate it all together, all the ingredients added up to a perfect bite. 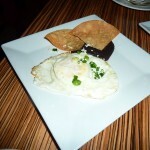 Brett ordered the seared eggs and short rib mushroom hash. 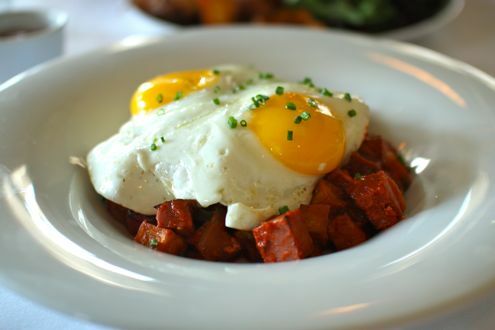 While it wasn’t a bad dish, it could not hold a candle to the Wagyu corned beef hash he had at Bluestem in Kansas City last fall. 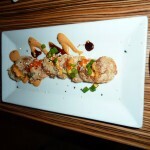 9’s rendition was more on the bland side and was lacking flavor. Again, if it wasn’t for Bluestem’s excellent preparation, he probably would have enjoyed this dish more. 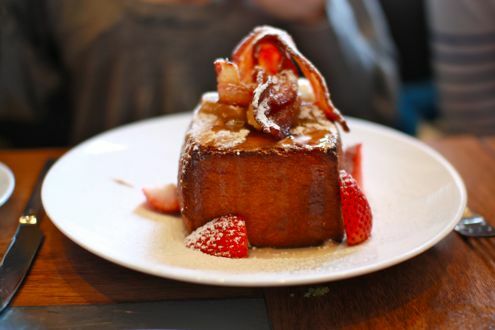 While I admit that I was skeptical at first, The King French Toast at 9 is definitely an amazing dish that I would recommend the next time you’re in New York and looking for a good brunch spot. 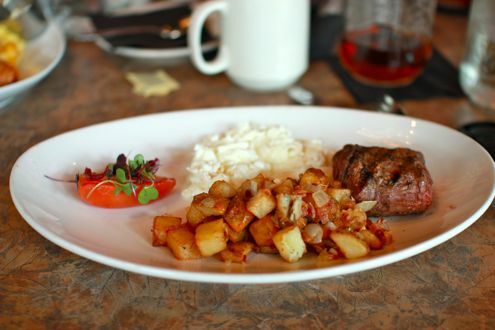 I was happy with my choice and it reminded me to be more adventurous when eating out and to not always go with standard eggs and potatoes fare. 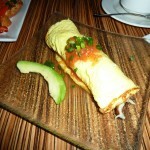 I’m fairly certain the “create your own omelet” would not have been nearly as fun as my breakfast that morning. As you may have guessed from our Twitter posts over the last week or so, I was just in New Orleans for nine days for my company’s annual meeting. Our meetings are so large (20,000+ attendees) that we can only rotate between a handful of cities. Let’s just say that the years we go to New Orleans and Las Vegas are a little more anticipated than our conventions in Anaheim and Orlando. Anyway, it’s become tradition that Brett has tagged along either in the beginning before things get too crazy or at the end after the storm has passed. 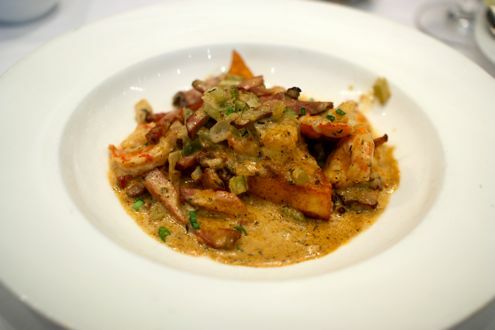 We’ll get to some places that Brett and I went together later this week, but for me, I have to start at the end with one of the most decadent meals I had in NOLA. There are of course several places like this to choose from, but I decided to end my New Orleans week with the famous Breakfast at Brennan’s. 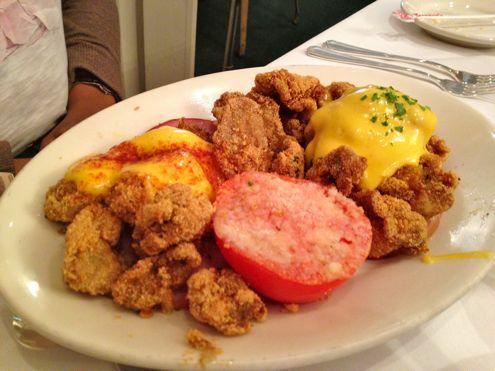 Brennan’s on Royal Street has been home to gluttonous breakfasts and dinners since 1946. I went in with three other colleagues fully prepared to roll ourselves out, and that we did. 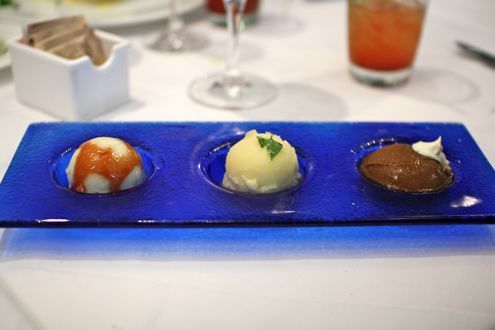 We each decided to go with the three-course prix fixe menu for $36, because, well, when in Rome, right? Everything sounded so good that it was difficult to choose. 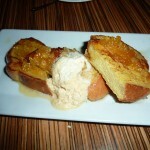 I started with the Creole Bloody Mary and decided to try the Southern Baked Apple with double cream as my appetizer. I got the cream on the side just so it wouldn’t overpower the apple, and I have to say dipping the apple in the cream was a fun way to eat it. 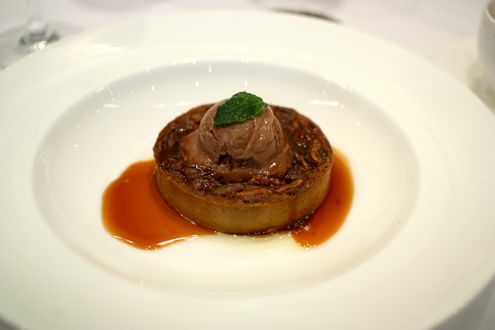 The apple was huge and tasted more like a dessert than a breakfast starter, but I was in heaven. If this was any indication of what was to come, then we were in for a treat. 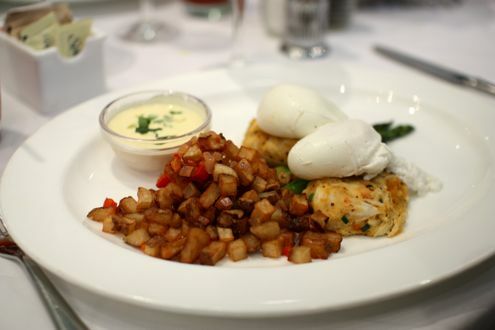 For my entree, I ordered the quintessential New Orleans breakfast dish, Eggs Sardou. 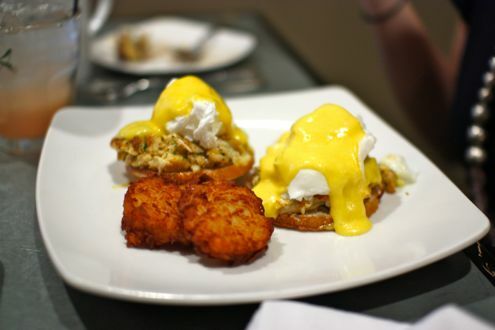 If you’re not familiar with the dish, it’s poached eggs on artichoke bottoms atop a bed of creamed spinach and covered with Hollandaise sauce. 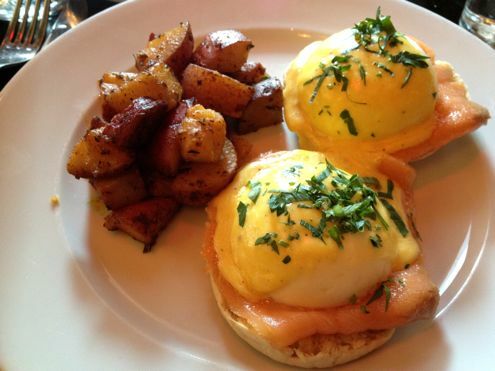 Again, I got my Hollandaise on the side, because I’m just not a big fan of Hollandaise. 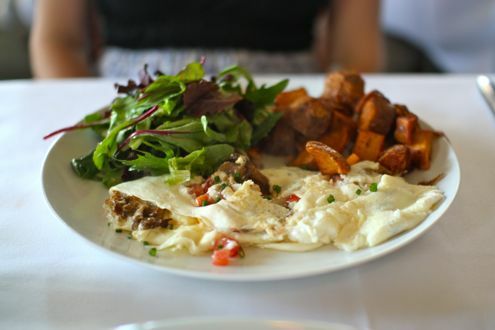 Other dishes ordered at the table were the the Oysters Benedict, Eggs Houssarde (another famous dish), and the Eggs Bayou. 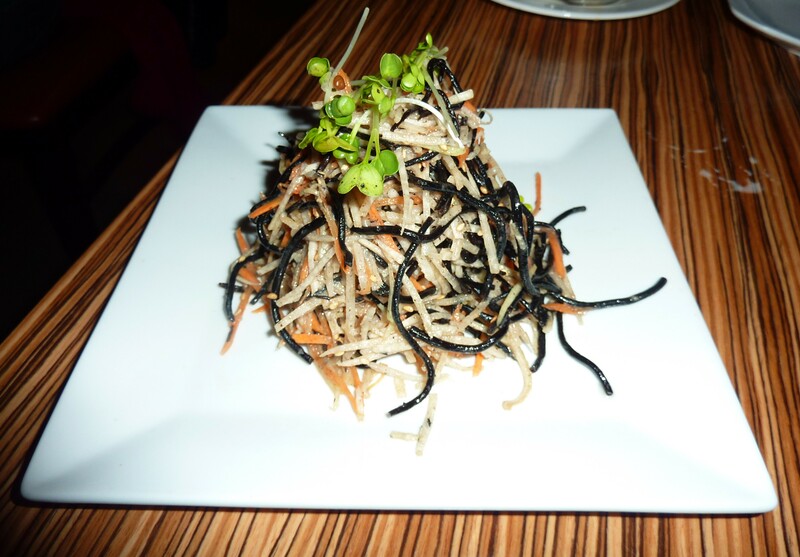 I was in love with the dish itself. 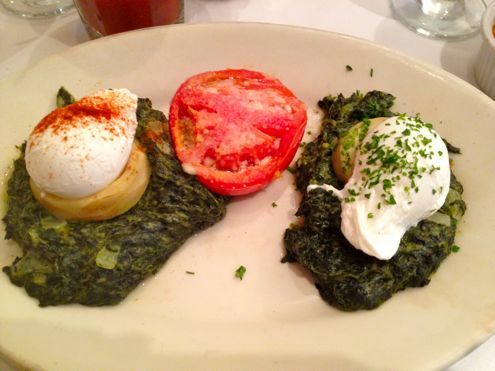 The yolk of the poached eggs ran into the already creamy spinach and stacked with the artichoke, making for a perfect bite. The dish also came with a grilled tomato with Parmesan cheese, which we all enjoyed. The spinach wasn’t too heavy or overly creamy, and I had to resist finishing every bite in order to save room for dessert. Ah yes, dessert. While there were many tasty options on the menu, it took five seconds to make the decision to order the Bananas Foster. 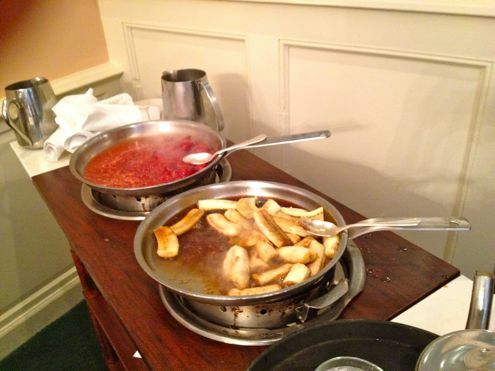 One of the things Brennan’s is most famous for is the Bananas Foster as the dish was actually invented here. Our waiter Ron was quite the ham and enjoyed putting on a show of flambéing the bananas and strawberries for the crepe dish. How did it taste? It was divine. 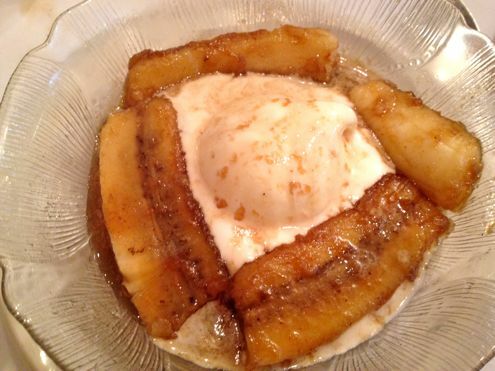 The bananas were of course sautéed with butter, brown sugar, cinnamon, and banana liqueur, and then served over vanilla ice cream. 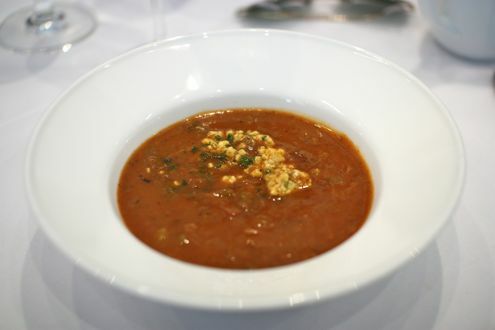 It was the perfect end to an incredibly decadent meal and a foodie’s dream week in New Orleans. 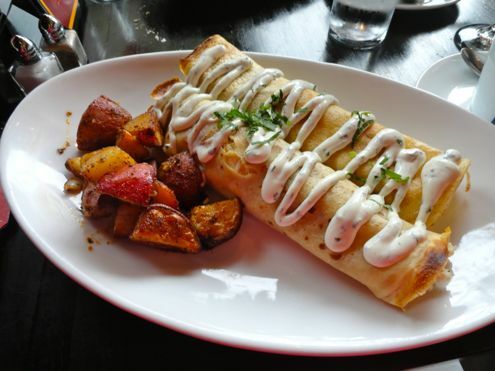 I recently heard about the deal at Masa 14 for Sunday brunch, and upon first glance, it seemed too good to be true. 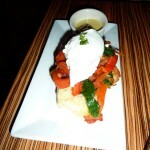 My friend Livya and I decided to check it out for ourselves and indulge on unlimited tapas and drinks for $35. 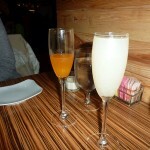 We decided to order some drinks first, with Livya choosing the Masa Mimosa while I got the Lychee Bellini. Both were very refreshing and we hardly noticed when they would come by with pitchers to refill. 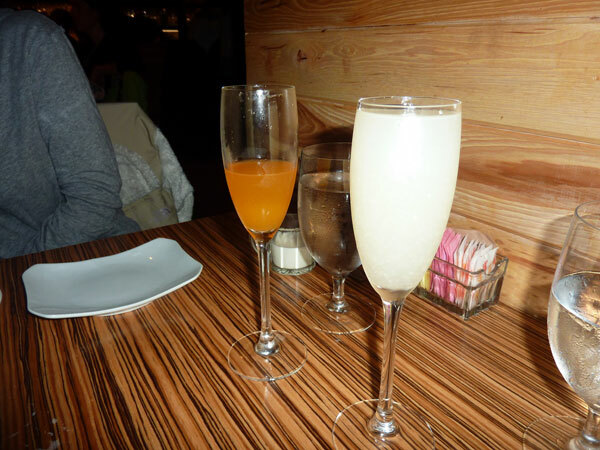 I think we each had about four glasses, but it was hard to tell since the servers never let our glasses go empty. 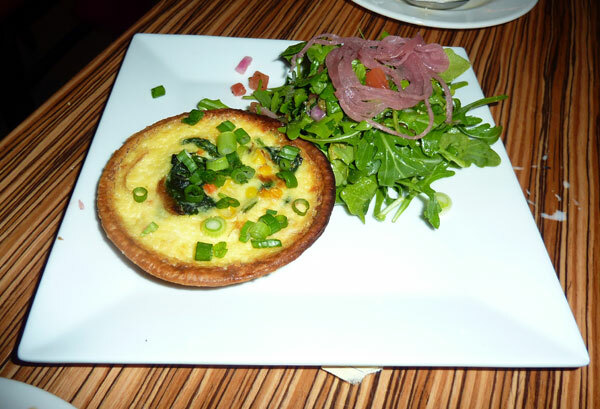 To start, we ordered the Daily Petite Quiche, Hijiki Seaweed-jicama Salad, Petite Mushroom Escabeche Omelet, Veggie Benedict, Black Bean Puree, and Spiced Tuna Steak. 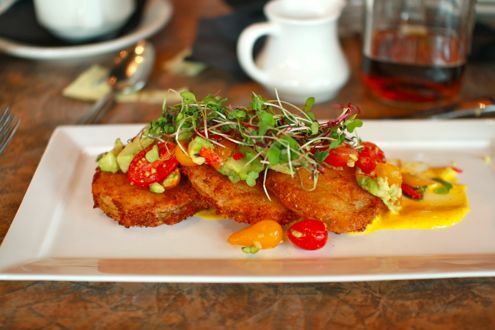 Granted, this may appear like an excessive amount of food, but Masa 14 specializes in Latin-Asian tapas, so these smaller plates are meant to be shared. 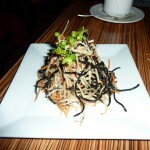 Overall, everything was delicious, with some standouts like the seaweed salad, tuna, and omelet. Some of the dishes were definitely heavier than others, and before we knew it, we were getting full with all the plates in front of us. The rare tuna steak came on a sandwich bun along with a small but thick piece of bacon, avocado, and wasabi. The bread wasn’t really necessary so we discarded it to focus on the high quality piece of fish. 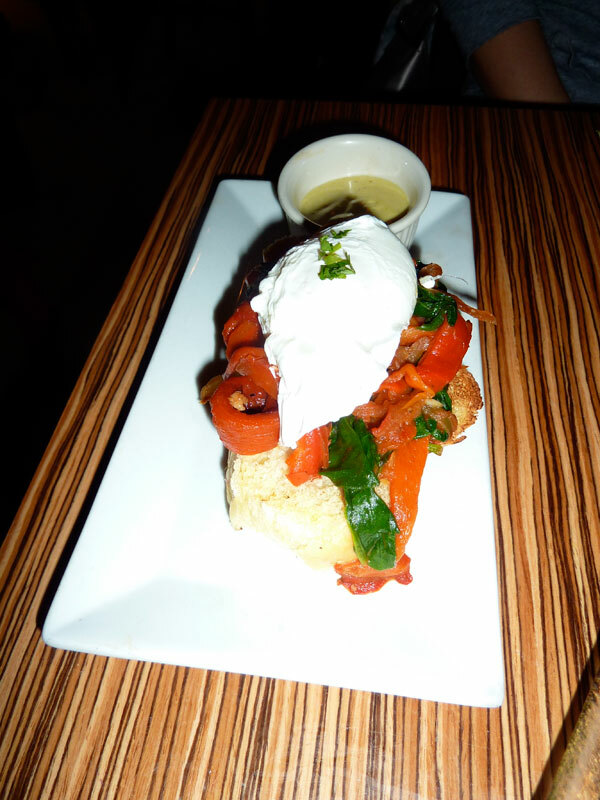 The Veggie Benedict was actually a variety of roasted vegetables with a poached egg atop a piece of challah bread. 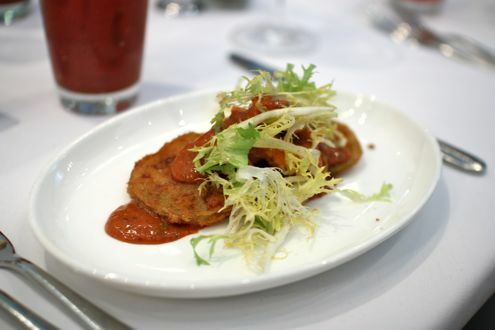 Again, a nice dish but the bread seemed to overpower the rest of it. 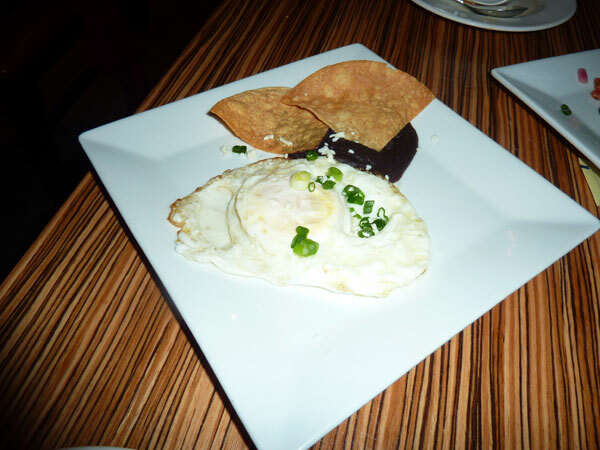 The black bean puree was a perfect bite with a scoop of the puree with poached egg on a tortilla chip. 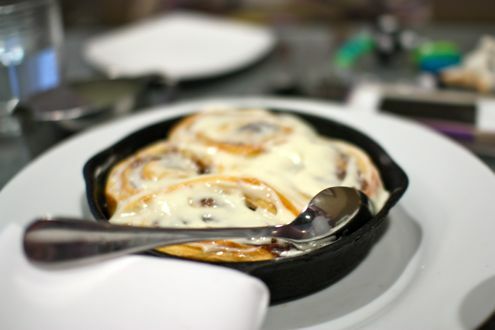 We decided to order a few more items to stretch out our relaxing and gluttonous Sunday. Up next was the Fruit and Granola with yuzu yogurt, the Pan Dulce with ancho whipped cream and pineapple syrup, and to top it off, the Crunchy Shrimp. I know looking at these selections, you might think, “dessert, dessert, and shrimp?” Yes, it definitely did not belong, but with unlimited options to choose from, it was simply too hard to resist. 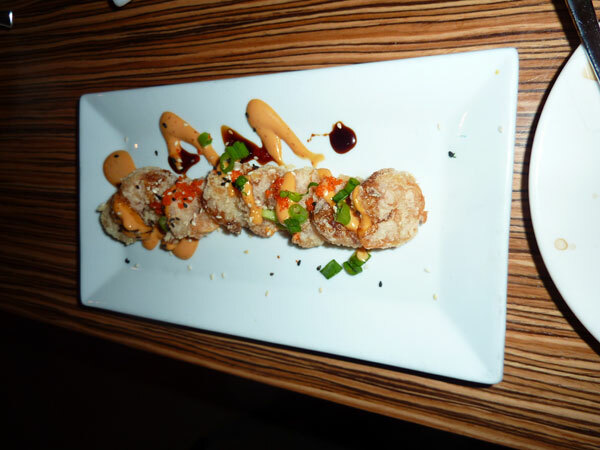 The sesame crusted shrimp came with a chipolti aioli sauce that went perfectly together. We only ate one or two, and then it was on to dessert. 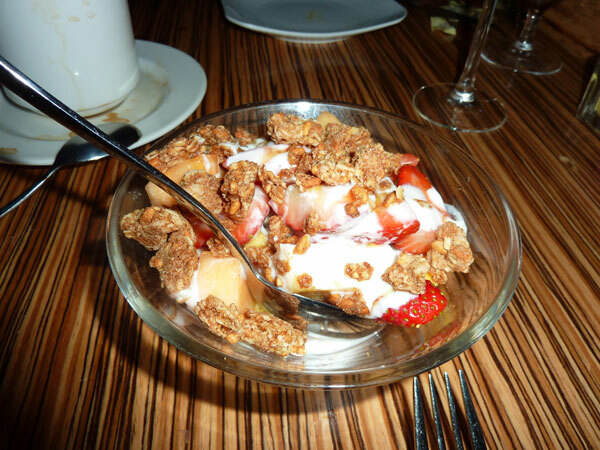 The fruit, granola, and yogurt combo was nice and light, and definitely the healthiest thing we ate all day. 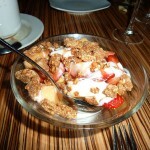 The large chunks of homemade granola were nice and crunchy and elevated the dish to more than just a bowl of fruit. 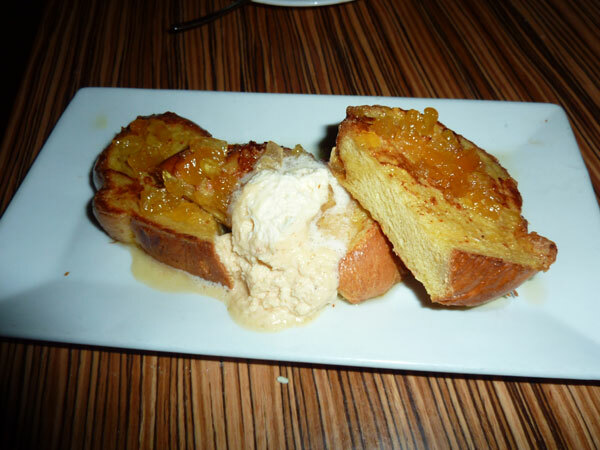 The Pan Dulce tasted just like French toast and was a perfect way to end the meal. 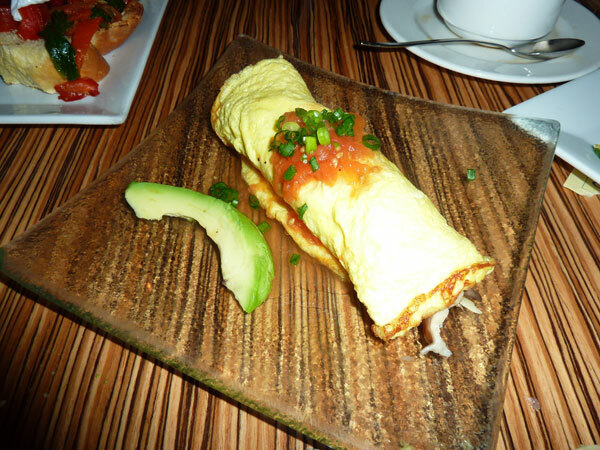 All in all, brunch at Masa 14 is a great opportunity to try lots of different items on the menu without feeling limited by price. It’s hard to tell how much of a deal it was, since we didn’t individually add up each dish to see if we would have spent as much or less compared to ordering a la carte. 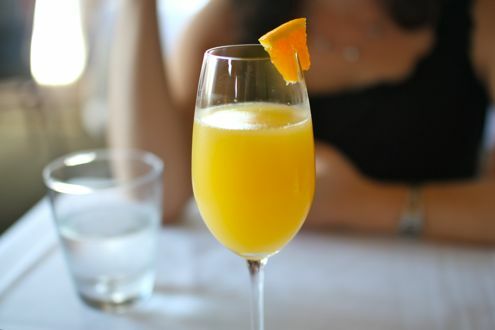 However, the unlimited drinks alone makes the $35 brunch worthwhile. 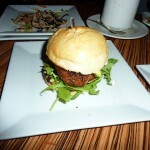 If we went with a larger party we would have been able to try more dishes, but regardless, we undeniably left satisfied. I could potentially see us going with a group of 10 and basically ordering the entire menu, with everyone being able to have more than their fair share of food while already knowing up front what the bill would amount to. Hmm, this year’s birthday idea perhaps?